I have been wearing Shade layering pieces since. well. the beginning of Shade. Before the stores and the website, back when you had to attend a house party to get your hands on a Cap Sleeve Tee. That was before the stiching changed, and before they decided to do far more than just undershirts. I would be embarrassed to tell you how many of their tee shirts I have in my drawer. I have had them for years, and I still wear every one. Not at the same time of course. Shade now does it all. Tops, Bottoms, Swimwear, Maternity, even Dresses. And don't forget their original undershirts are still around, only better. 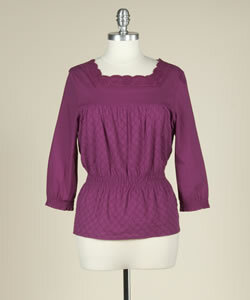 CJane will also receive The Shade Eyelet Top in Berry. Leave a comment on this post telling me which New Shade Arrival is your favorite. To make me feel better, you can also tell me how many Shade undershirts are in your drawer. poplin shirt dress. AMAZING. I love the green and I have been looking for a new button up, modest dress. I have so many cami's my fiance doesn't understand why it is necessary to have 3 white ones! Love the eyelet top with lace! I love the poplin shirt dress. That green is fabulous. I LOVE the D-Ring jacket. SOoooooo awesomely cute. Love the striped, scoop neck, 3/4 sleeve in green. Can i admit I have never heard of shade house parties? Must be a Utah thing? Anyway, I wish I had some of those undershirts in my drawer, but given a choice I might have to go with the eyelet top in berry also. . . I LOVE the d-ring jacket. Seriously cute. Just became a FB fan. I'm loving the new swim suits, especially the colors! I am a fan of Shade on FB. That Monaco swim top in turqoise is adorable! And SHADE is a new company to me, so no t-shirts in my drawer. I love the Poplin Button Skirt. So cute!! That D-Ring Jacket is so adorable! FV button is up! come visit! I really like the 3/4 Sleeve V-Neck Cardigan. I don't have any Shade... I know, but I am from Europe, I guess that is my excuse!!! The funnel neck zip up is such a fun little coat. I need some layering tees. Really. I don't have anything from Shade yet, no tees, nada. I live in Cali....thats my current problem. Pick me! I added the FV button! That zip up is very pretty! Love the poplin shirt dress! Poplin shirt dress is my favorite! The Poplin Shirt Dress! I love it! Let's see...I have 4 white cap sleeve shirts, one brown, one black and one long sleeved black and one black tank. I actually kind of miss the old seams, but am getting used to the new ones. And I LOVE the D-ring jacket. I'm a jacket kind of girl. WAY cute. I am now a fan of Shade on Facebook! My absolute FAV is the Plaid Riviera Swim Top and Slimmer swim bottoms! And I have countless layering tanks already in my dresser, I love Shade!!! And now I follow you! Don't you just love finding new blogs to read? I like the ribbed skirt in grey. I really need a new skirt. I only have one of there under Ts. It was a long sleeve until I took the scissors to it. I have my eye on that cute short sleeve jacket with the tie around the waist... SO perfect for spring!! the lounge shorts and poplin skirt are my favorites! man i LOVE shade! I love the lounge shorts! If it makes you feel any better, I stopped counting my Shade shirts at 100....I may be a tad obsessed. The poplin skirt is darling. Currently I only have one shade shirt, the rest have been retired. Time to re-stock! D-Ring Jacket I think. Very nice. I do love the eyelet top in either color. And I have a ton of shade shirts. I don't even know how many. Hey - maybe we were at the same parties. I have been wearing Shade since the begining and still have and wear the 1st shirt I bought. I really like the Poplin Shirt Dress. I love the funnel neck zip up the best. I want the ibiza print swim top! I haven't had a new swimsuit for over 5 years. Oh, that D-Ring Jacket...where have you been all my life? I love the funnel neck zip up! I have oh...about 15 shade undershirts in my closet along with like 6 or so 'fashion' shirts in addition! The poplin shirt dress looks so summer-y! I love it! I want the Poplin Shirt Dress...great for summer. I have 4 Shade shirts already, that my mom brings back for me when she travels to Utah. Hmmm...I feel like someone has been holding out on me!!! I had not heard of Shade until today! I LOVE the cap t-shirts! I feel a purchase coming on! my favorite new arrival is the denim skirt. love it. I love the white eyelet top with lace. D-Ring Jacket- So cute! Never heard of Shade cute stuff! I also love the denim skirt. And I must have a dozen undershirts...in, like, all the colors. Can't have too much Shade. They are all so lovely but I do love the eyelet top you posted! i love the new shade denim skirt! i follow shade on facebook! I am loving the d ring jacket...and I have at least 3 t-shirts. So many great pieces! I love the 1/2 sleeve wrap maternity top, and the poplin dress is wonderful. I really like the Cannes Swim Top in the blue and green stripe! The Riviera swim top is adorable. It reminds me of those little girl swimsuits they used to make with the ruffles around the neck and waist. I LOVE the D-Ring Jacket in Green. So perfect for Spring! Poplin shirt dress! I love shade! oh i love the poplin button skirt! adorable. The maternity skirt looks great! I LOVE Shade too. I have at least a dozen and a half of their layering undershirts, a couple of their dresses, and some other tops. My newest favorite item is the lounge shorts! I got my pair a couple of weeks ago and wear them all the time now. They are perfect for the hot Florida spring. Love the funnel neck zip-up. So comfy looking!! The poplin shirt dress is SOOO cute! I love the length of the swim shirt!!! i love the new lounge shorts, they look cute and comfy! I really like the riviera swim top...and the printed scarf! I really like the poplin dress and also the long skirt! I, like everyone, loves the poplin shirt dress. MUST HAVE! and i have three white shade shirts, one black, and 3 tanks in my drawer. What don't I love from the new spring line?! Everything is beautiful and I love all the colors. I love the striped scoop neck shirt in green. I love the Short Sleeve Button down. Simple, but practical and oh so cute! Love, love the Poplin Shirt Dress. Love Shade! Oh, I love the plaid swim top and skirt bottoms. But I love the button down short sleeve, too! I'm a huge shade fan too! I love how all of their shirt are long. I am a facebook fan of Shade! I'm loving all the swimsuits - wow! i love the funnel neck zip up! I LOVE the poplin shirt dress! I have NOTHING of shade in my closet, and as a convert, I think I need a few things to help with my wardrobe! The Poplin Shirt Dress and the Ribbed Skirt are beautiful! I love the Berry color! I follow family volley blog! Love the Poplin Buttin Skirt. I have only a few undershirts though...not an undershirt fan. I love the poplin shirt, and my fave new arrival is the Lounge shorts. Way cute! I also have about 5 shade items in my closet. :) Love Shade! i also am a lover of the poplin shirt dress in green . . . I love the Poplin Shirt Dress and I actually love the Eyelet shirt as well. I'm also a follower of Family Volley. i follow. . . and also think the poplin button down skirt is pretty! I love the poplin button down skirt! too cute! Makes me wish summer was already here! any of the spaghetti strap camisoles. i wear them under everything! The poplin shirt dress is my favorite.. I would wear the D-Ring Jacket with any of the half dozen undershirts I have in my drawers! I have wanted the Scoop Neck 3/4 Sleeve w/Cuff for a long, long time! I don't know why I don't just buy it. But it looks like the perfect undershirt to add a little modesty or to wear by itself with a little accessory embellishment! the St. Tropez swim top is lovely! The D-Ring jacket would be perfect for Spring! I love the Striped Cannes swim top. Adorable! I really like the funnel neck zip up! The D-Ring jacket is super cute! I really like the Denim Skirt! and I have too many Shade shirts to count. I have a serious hoodie addiction...so I would have to say the funnel neck zip up! LOVE the new shirt dress! I like the funnel neck zip-up. My favorite new arrival is the funnel neck zip up...I have 12 undershirts in my closet, I wear one every day! My favorite is the poplin button skirt. I love the denim skirt. Usually they're all way to slitty. And I'm a shade FB fan. The lounge short! Bring on summer! that poplin shirt dress is amazing! I really like the ribbed skirt. I am a shade fan on facebook. I really like the printed scarf, but since I don't own any Shade shirts, I really like all the basics as well! I may have to order a few! The D-ring jacket is cute. I also like the printed scarf. Love the Monaco swim top. Cute and modest! The best combo in swim suits. I have at least 7 shade tops. What would I do without them? Poplin shirt dress and poplin button skirt are my faves! I own NO shade clothing *sniff, sniff* Maybe I will win this and start my collection! I'm now a fan of Shade on Facebook! AND I'm a Shade Fan on facebook! The poplin button skirt is too cute for words! i love the poplin shirt dress! the lounge short are bomb diggity. as for the undershirts, i want to say 6-7?? I love the eyelet top with lace! i'm in desperate need of a new swim suit and loved the striped cannes swim top...i may just have to get it! poplin shirt dress. Have about 10 shade items. love them. i love the swim suits. i get so excited every summer to see the new styles. I love the maternity band skirt - I need something like that! The Funnel neck zip up is calling my name! Maternity Shirred Band Skirt in Charcoal... for sure... but it might be I preggo too! I like the lime green poplin shirt dress. ooooh, I am a BIG fan of the Funnel Neck zip up! So warm and cozy. I like the Poplin Shirt Dress. Very sassy! I am just barely into my 20s and I think I've owned and loved every one of my Shade shirts for longer than I can remember. I have 20+ and my husband thinks it's ridiculous, but I wear them all the time! The ribbed skirt looks super comfortable. Just love the Funnel Neck Zipup. Love the D-Ring jacket. I bet I have at least 15 Shade shirts of one type or another in my drawer. I would love to add this one! I left you a question.